Barts and the London School of Medicine and Dentistry, Queen Mary University of London, has a long history of providing high quality postgraduate education for clinicians and scientists working in the National Health Service (NHS), Public Health England (PHE), and industry. The aim of this programme is to prepare you for the next stage of your career, whether pursuing further research or professional study, or entering employment in the field of Biomedical Science. The course can also enhance the career prospects of those aspiring to middle and senior management positions within the NHS Pathology Service and commercial sector. The course aims to promote teaching and learning enriched by original scholarship and scientific research; encouraging students to become independent learners. Formal teaching comprises lectures, workshops, practical classes and demonstrations. Many of the lecturers are specialists in their field and are invited from many institutions within the UK. The practical classes are an important component of the course and are designed to give the students hands-on experience, particularly in basic clinical microbiology. Students are encouraged to relate current practices in their workplace to their studies, to discuss and critically evaluate these techniques with their colleagues in light of their formal teaching. 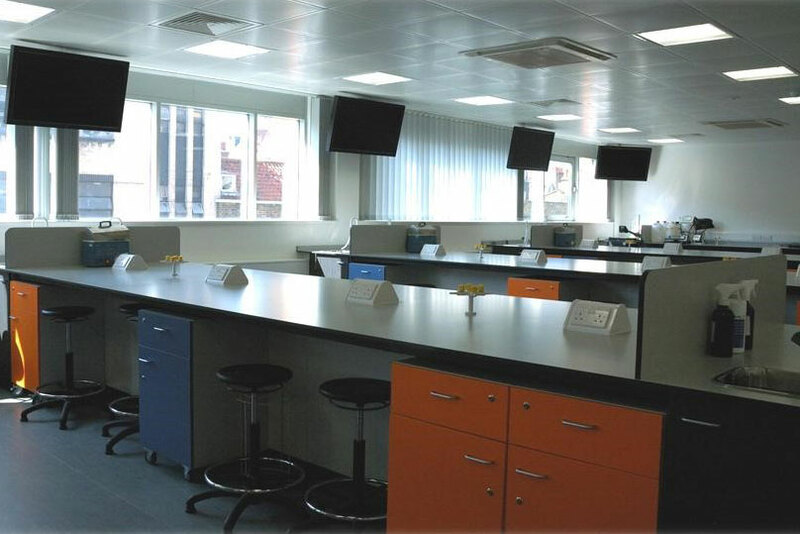 The practical classes are taught in the purpose built teaching laboratory, which is well equipped with all necessary materials and is based on a routine clinical microbiology laboratory. In addition to the formal face to face teaching, students use online learning materials in the University's electronic learning environment (QMplus). Self-directed learning, by reading and reviewing literature to supplement the lectures, is essential and students are encouraged to use the library (both electronic and onsite) and computer facilities within the University. All students have off site access to the library and the electronic learning environment. Why study Biomedical Science at Queen Mary University of London? Barts and the London School of Medicine and Dentistry is comprised of two world renowned teaching hospitals; St Bartholomew's and The Royal London, which have made, and continue to make, an oustanding contribution to modern medicine. We were one of the top five institutions in the UK for medicine in the 2014 Research Assessment Exercise. You will have access to the University's comprehensive libraries, including the Postgraduate Reading Room. You will also have access to a large collection of basic medical and dental texts in the main library at Mile End. The Library is open seven days a week. This resource is complemented by the two large medical and dental archives based at the Royal London Hospital and St Bartholomew's Hospital in older, architectually distinguished buildings that are well worth a visit to experience their unique atmosphere and history. The British Library is also within easy access and can be used as a comprehensive research resource. Teaching takes place on the Whitechapel campus of the medical school. At the heart of the Whitechapel campus is the Blizard Building, which houses state-of-the-art facilities for students and staff: open-plan research laboratories, office space, a 400-seat lecture theatre and a café, and several seminar rooms. For further information about the course, please contact: pgmicro-admin@qmul.ac.uk. The course is offered with both part-time and full-time study options. To study this course as a part-time student you must be employed in a suitable laboratory within the NHS, PHE or the private sector and your employer will need to support your application, be able to give you time to study and provide a suitable project. The taught element of the course is provided one day a week and you will also be expected to undertake additional private study. In your first year of study you will attend on Tuesdays, and in your second year your day of attendance will be Thursdays. Undertaking the course full-time is most appropriate for overseas students and, more generally, recent graduates in biomedical science who are not already working in hospitals, medical schools, public health institutions and similar institutions. Full-time students are attached to the Centre for Immunobiology within the Blizard Institute (please note this is not a clinical attachment). Full-time students study for 12 months and will be expected to be able to attend teaching sessions at the University on Monday - Friday. In addition to the Tuesday and Thursday teaching shared with the part-time students, there are tutorials, research and clinical meetings on other days. To enable the full-time students to participate fully in discussions about laboratory techniques and clinical cases with their part-time colleagues who are attending by day-release, additional tuition is provided in the formative studies module during the attachment to the Centre for Immunobiology. The additional tuition provides further hands-on practical experience using material designed to reflect the clinical samples and laboratory procedures in a routine hospital laboratory. The students are encouraged to complete the practical work as individuals to gain maximum experience, but discussion within the group and with the tutor is encouraged. Additional theoretical tutorials are also used throughout the year to broaden the students' experience of clinical microbiology. These tutorials include case presentations to and by the students, workshops, discussion sessions, question-and-answer sessions, and oral presentations by the students. Full-time students receive additional assignments to be completed throughout the year to allow them to monitor their own progress. Full-time students are also encouraged to attend the regular clinical journal club at Barts Health NHS Trust and research meetings within the Centre. It is essential to note that candidates require a background in Biomedical Science. The background of the applicants is usually at least a 2:1 degree in Biomedical Science (we may consider alternative degrees if they have significant relevant content) or any similar international qualification, at degree level. As well as your overall degree we also look at your performance in individual modules within your degree when considering your application. For those with clinical or nursing qualifications we suggest that you consider applying for the MSc Clinical Microbiology. Applicants who do not reach academic standards but have alternative qualifications (e.g. Fellowship of the IBMS) and relevant work based experience may be considered for a place on the course at the discretion of the Postgraduate Dean (or their representative) and the Programme Director. Students from outside of the UK help form a global community at Queen Mary University of London. For detailed country specific entry requirements please visit the International section of our website. If your first language is not English, you must provide evidence of your English language proficiency. You can find details on our English language entry requirements here. If you do not meet language or scholarly requirements it might be possible for you to undertake foundation or pre-sessional programmes that will prepare you for the Masters course. For more information, please contact the Admissions Office. If you are unable to find the information you require, please contact the Admissions Office for assistance, or the course team at pgmicro-admin@qmul.ac.uk. As students at Queen Mary University of London, you will be expected to play an active part in the acquisition of your skills and knowledge. A variety of teaching and learning methods will be employed in the MSc programme including: seminars, laboratory practice sessions, self-directed learning, tutorials, case presentations, supported by reading lists of books and journal papers. Students are assigned a personal mentor who will guide them in both academic and pastoral matters throughout their time at Queen Mary. For every hour spent in classes students will be expected to complete further hours of independent study. The individual study time could be spent preparing for, or following up on, formal study sessions, reading, producing written work, completing projects, and revising for examinations. The MSc modules are assessed using a combination of final written examinations and a series of in-course assessments. The in-course assessments consist of literature reviews, oral and poster presentations, practicals and written exams. They are designed as a learning experience as well as a test of knowledge. The Research Project is assessed as a 15,000 word written dissertation, and an oral presentation. "I am from Namibia and did my MSc in Medical Microbiology (Biomedical Science). I chose a taught Masters because I wanted to hone my knowledge and skills in diagnostic microbiology and specialise in medical microbiology. The programme at Queen Mary is an excellent programme which has met my expectations and more. The lectures were offered by highly qualified professionals who are experts in their respective fields. I particularly loved the practical's as they allowed students hands-on experience and I have learned a lot more than what I knew. The staff members in our department are very friendly and always willing to help. I am now back in my country and currently working as a Laboratory Scientist at a University and will soon apply for a lecturing position." "The full-time course started off quite intensely, studying with doctors and clinical scientists, but we soon caught up and it was so satisfying to see how fast we progressed and how quickly we were learning. Having more knowledgeable students around us was great because they served as extra teachers who can answer questions and give you information from their experience. I never felt under-supported because the organisers were always there if we were worried or needed help. Lectures were taught by experts from top universities, members of national committees and leading researchers, and we had tutorials and extra assignments to ensure we were keeping up, along with additional practicals to recapt the week's sessions. Practicals were well run and I found, lots of fun. We were given plates and lead through the microscopy and secondary testing of the pathogens, taught to distinguish between species or had to match the case information to the pathogens. These were followed by discussions where we benefited from the knowledge of our more experienced peers. The course as a whole is tough, but it's an MSc, so you work hard and reap the results. I particularly like the clinical focus and the hard work of the organisers is very evident in how smoothly the course runs and what amazing lecturers we had."